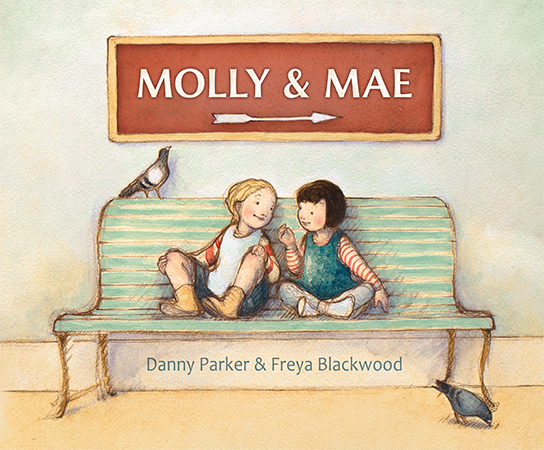 Molly and Mae are friends who are going on a long train journey. We are caught up in the joy of being a child about to start an exciting journey - running around, playing hide-and-seek, exploring all the vending machines, and other giggly, giddy fun. Once the journey starts, we see Molly and Mae’s antics begin to pall on other passengers, until finally, like over-wrought kids everywhere, they get annoyed with each other and slump into boredom. The sullen sky and rain make the outside world echo their inner world. At last, they find a way back to each other and their friendship becomes strong again. The train journey’s stages become a metaphor for the children’s fluctuating friendship, and I know both kids and adults will recognise moments in their own lives when words have harmed or healed. My interpretation of Blackwood’s illustrations sets the story in Australia, in the fifties or sixties perhaps. There’s that wonderful golden light we saw in Perfect, and a mellowness that is sustained even through the children’s falling out with each other. Read about Blackwood’s process in developing the illustrations here. I am awarding the Book Chook Feather of Approval to Molly and Mae! The partnership of Blackwood and Parker quite simply results in stunning books. May they continue to create not just masterpieces, but books that resonate with children and adults alike. Molly and Mae would make an excellent choice for librarians seeking a “friendship-themed” picture book, and will become a much-loved children’s classic.